ALK Technologies has stepped up its satellite navigation game by adding a more advanced traffic service to its CoPilot Live USA and North America iPhone apps. Dubbed ActiveTraffic, CoPilot Live’s new optional service uses real-time traffic flow information from Inrix, a company that basically eats, sleeps, and breathes traffic data for business and, increasingly, consumer apps. ActiveTraffic is ALK’s bid to get more competitive with heavy sat nav hitters like TomTom, as it provides continuous traffic monitoring and route calculation, alerting you when delays or faster routes are detected. This new ActiveTraffic feature can be activated in-app with a 14-day free trial. If you find that your daily commute times improve, you can purchase a yearly subscription for $10, or subscribe to ALK Technologies Premium Live Services for $20 per year, which also includes its Live Fuel Prices service. Inrix does offer its own basic map and traffic monitoring iPhone app for free in the App Store (awkwardly named “INRIX TRAFFIC! 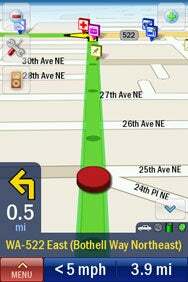 INRIX TRAFFIC!”), which is more akin to Google Maps infused with better traffic and route tools than a real sat nav app. However, the company does a poor job of explaining to customers that most of its app’s features are available only after an in-app purchase of either a $10 yearly subscription or $25 lifetime membership. The new 8.2.0.264 versions of CoPilot Live USA and North America also gained a handful of other features and fixes, including full map updates for new Q2 2010 data, MapSure reporting to submit map update requests from within the app, better performance when multitasking on iOS 4, and improved memory usage for iPhone 3G and 3GS owners. CoPilot Live USA is $5 in the App Store, and the North America version is $20. Both updates are available now for existing owners, and they require an iPhone or iPod touch running iOS 3.0 or later.